PZ MYers likes to post links to the various unscientific polls that query the popularity of Evolution vs Creation. 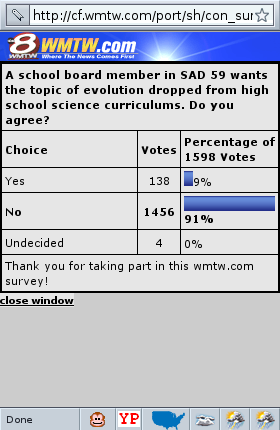 The latest, from a local television station somewhere (probably in the American south -I really couldn’t be arsed to sort it out), asks, “a school board member in SAD 59 wants the topic of evolutio0n dropped from high school science curriculums. Do you agree?” If we dismiss the equivical meaning of whether or not a school board member is that ignorant, nearly 1500 people voted “no” to the intended meaning of whether they agree with evolution being dropped. Now, true enough, the poll was very likely hammered by one or more of PZ’s minions (I’m only hating because my minion count is “2″) hitting the “Refresh” button in their browser, but it leaves one to wonder: why don’t the Creationist nutters do the same? They’re either honest (WWJD?) and have too much integrity, they’re not technically savvy enough to figure out their browser’s refresh button, they don’t have a Creationist blog popular enough to get the word out, or there just aren’t enough Creationists available to cast a vote. Did I miss any options? I’m sure any creationist that happens upon this post would immediately jump on the first option, but he/she really shouldn’t bother since others (i.e. Expelled, Dr. Dino, Dembski, et al) have already disproved that hypothesis in spades. This entry was posted in blogging and tagged creation, evolution, funny, polls. Bookmark the permalink. Why is that true enough or very likely? A lot of people read PZ; 1400 voting individually does not seem at all unlikely. And, at that time, PZ’s post was only up for about an hour or so by the time I posted this one. As much as I’d like to believe it was 1400 unique voters, I just don’t think it’s very likely.